Once’(Ōncé) spent his life, all three years of it, strutting around the woods of Akron, Alabama. While I only had the pleasure of spending a mere week understanding how Once' ran his shop, one week was all that was needed. He had his women, he had his land, he roamed it, and he owned it. He was the monarch of this tract in Central, Alabama, which consisted of 200 acres of pines with a creek making a perfect circle around the pine plantation. The creek created a nice bottom surrounding the big stand of Alabama pines. Once' road this bottom most of the day, scratching alongside the creek and loafing in the shade, occasionally working up into the pines that offered two small dustbowl type of fields. He would pitch up at any point along the creek when darkness approached. His roosting site was completely random, which made getting in close proximity predawn a near impossible endeavor. He was consistently inconsistent in everything he did, but there was one thing that you could always count on; Ol Once' would gobble, and gobble, and gobble, and after that he would gobble some more. At minimum he would sound off 100 times in a morning and there were a few hunts he gobbled well over 200 times. He loved to hear himself talk. I hunted the gobbler for a week and was joined on most hunts by close friends, and even my girlfriend on one occasion. Every hunt, he put on a concert that I felt guilty witnessing without paying money to attend. Gobbling all morning and dancing circles around us at eighty yards in full strut. In the process, this old tom drove me to my mental breaking point every single morning-for a week. This is the story of Once'. The first morning we hunted in Akron was the best chance we had at Once', little did we know at the time. We really didn't know what was in store for us, it had been two years since we stepped foot on the land during the spring turkey season. It was myself and close friend, Anthony Woods, on a dreary morning at the end of March. We were smack in the middle of turkey season and had already run our first couple of options dry, so we decided to give Akron a look. It was Anthony's fathers land, he had owned it for as long as I could remember. There had never been a heavy concentration of turkeys on the place, despite it being a pretty solid environment for them. We've hunted deer and turkey on it before but had pretty much gave up on it a few years back in lieu of other hunting spots we had available that were better year in and year out. We parked just short of a big pasture running east to west with the pine plantation starting beyond it. We eased quietly through the pines down a hill that led to the creek, and back up into the pines until we reached a small field. The field was 50 yards horizontally and vertically, just the type of place you would want a tricked tom to prance into. There was nothing to it, just a dusty spot amidst the pines, which seemed perfect for a big gobbler to make his primary strut zone. We set up among a group of pines big enough to conceal our backs, with just enough cover to hide and shoot in front of us. We had a road to our right that wound through the pines and opened up to another field that was the same type of dustbowl area as the one we were currently sitting on. At 6:10, much to our surprise, a tom woke up the woods with a powerful gobble. It was just another gobbler to us at the time, before Once' received his name or revealed his near supernatural powers of wits and elusion. He was roosted on the creek bottom just below the second field, down the winding road to our right. We were set up perfectly, Anthony was on my right with an open view of the road and the field we were set up on. I had the Fred Zink special, the Avian X decoy, in prime position. Anthony was up to bat this morning, while I handled the calling. As the morning drew on, Once' kept firing off while on the roost. It was a very overcast morning, ranging anywhere from misting rain to a light rain. This didn't bode too well for my Reynolds glass slate, but it was my call of choice so I kept it dry in a plastic bag and conditioned it often throughout the morning. As the sky drew pink, I began to call a little more aggressively at the bird. He was gobbling early and often, one of the couple hundred gobble days for our guy, he was fired up. After 30 minutes of nonstop babbling, Once' flew down from his tree. I had called enough at that point, he knew exactly where we were, the bait had been set. Following the sound of his monstrous gobble, he had closed the distance a good 100 yards from his original post. He wasn't sprinting in, but moving slow somewhat steady, I called to him a couple times during this 15 minute time period. When I knew he had closed the distance to 100 yards I gave him a few yelps, and cut as good as I knew how. Evidently he liked it, within the next minute, he had moved a good 75 yards and gobbled directly in front of us just below the fields edge. I cut my eyes to Anthony to make sure he was ready to rock this tom’s world. Once' was in our bedroom. We were in that 30 second window that feels like eternity. I just knew that he was gonna come straight up the hill and appear into our field at any second, the Avian X was waiting his arrival. That wasn't his style though, after a couple minutes of deafening silence, he gobbled again. Only this time he had moved a 100 yards farther to our left, down a logging road behind the field we were set up on. I was a little stunned and we whispered our opinions to each other in a silent hunter's fashion. What was this bird's deal? Everything was set up so perfect for a textbook finish! He had moved from our wheelhouse to over a hundred yards away from us in no more than a minute. Anthony and I were still talking the situation out a moment later, when Once' screamed in my other ear. Now I've heard birds gobble close, but this was really a deafening, ground shaking gobble. He was close. Very close. I had my head turned whispering to Anthony on my right, so I slowly cocked my head back left as much as I would dare. As I did, Once' stepped out of the pines and into the field 15 steps from me. His head went aero dynamic as he shook the ground again with his thunderous gobble. My heart skipped a thousand beats in that second. This tom looked like King Kong and gobbled like Muhammed Ali! Once' began walking from left to right, across the field. The gobbler was to Anthony's left, like a wily old bird will do, he made an unexpected circle around us instead of coming in to our setup somewhat straight. So Anthony had a few trees he was working around to shoot him, and just couldn’t get the bead on him like he wanted to. Fumbling around a bit, I believe Once' saw Anthony and when he was halfway across the field he started to pace a little more quickly. I urgently started saying "shoot him! now! shoot him now!" to Anthony, but for nerves or fate, Anthony couldn't pull a shot off. Once' putted several times rapidly and skittishly hurried into the valley of pines beneath the field. We were sick. Not only did we let a gobbler get away that we had dead to rights, but we both knew there was something different to this tom. The thunderous explosion of a gobble, the way he skirted around us while approaching our setup, and the sheer size of the bird. I felt like we had caught Once' on the perfect morning and unfortunately didn't get the job done. As most turkey hunters will tell you, fooling an old longbeard to 20 steps and not killing him is a cardinal sin. The first hour of stepping onto the property, we had educated Once' from wise to Gandalf. The next morning I went after Once' again, against my better judgement because we boogered him the previous morning. I was riding solo that day, and this time I set up on the second field where the tom was roosted the morning before. I crept slowly up the road until I was 50 yards away from the field, and at 6:10 on the dot, Once' started hammering. He gobbled more on this crisp morning than I thought a bird could possibly gobble. I ended up setting my iPhone on the ground and used the microphone app to record the sequence of events. I threw everything in the playbook at him that day. I called one of his brigade of hens to 10 steps, but Once' wouldn't budge. He came to 80 yards and not a step closer. I tried a fighting purr sequence once I had brought the hen out from under him and that wouldn't do it. I tried shutting up for awhile and then spicing it up again. This tom was above my pay grade, I didn’t know what else to do. I sat on the field listening to him gobble until 9 AM and eventually realized that it wasn't gonna happen despite his enthusiastic gobbling. He was definitely accompanied with hens now, but the previous morning he was a lone soldier. I headed home with more questions than answers but couldn't wait to get up the next morning. The weather forecast was perfect for the whole week. On the third morning, I was accompanied by my good friend Steadman Shealy, as well as my girlfriend, Sandy Draper. We set up on the second field and hoped for the best. We decided to put some love in the air this time around instead of a lone hen. We set up the Avian X hen with a B-Mobile fanned out tom on her heels, hoping it would raise Once's testosterone enough to close the distance. He switched his roosting site, which made us a little uneasy, but he was still in our general area. We knew his travel corridors by now, and we were in the middle of main street. After adjusting our setup according to the new roost site, we settled in to see what the old gobbler had in store for us. He didn't disappoint. Steadman worked his Primos Tru Double mouth call while I worked the Reynold's slate. Once', once again brought music to the woods, gobbling nearly non stop on the roost. After flying down from the roost, he started working his way to us. We tree yelped early and did a fly down cackle. Our calling consisted of yelps and clucks, nothing out of the ordinary. We were very tentative to over calling him, since this was the third day hunting him. He worked his way out of the creek bottom and up into the pines, just like we envisioned it. Heading our way, we were pretty confident he was gonna make a mistake this time. Our decoys were set up nicely on an elevated part of the terrain, making them visible in a 360 degree fashion. Steadman first spotted Once' at 75 yards. He came in to investigate, in full strut, at 80 yards. Instead of taking the cheese, he zig zagged around us with his chest puffed out at in a circle at 70-80 yards. For the next 20 minutes he disappeared from our vision. He gobbled a few times in this period, and each time he gobbled, he was in the complete opposite direction from where he gobbled before. Bam he would gobble to our right. Five minutes later, he would gobble to our immediate left. He repeated this cycle three more times, circling us like we were in the middle of an Once' carousel. We never saw him once during this whole circus act. He was toying with us. We sat there for twenty more minutes until he gobbled again, this time he had moved well over a 150 yards. So we decided to make a move and split up. Sandy and I moved into the pines to the right of the field, where he was circling us just out of view, close to his roosting spot the first two mornings. Boom, he gobbled a 100 yards from us after about ten minutes of sitting. I started to call to him pretty aggressively, I was getting impatient with all of his antics. I turned him on. He was gobbling at everything under the sun, I was hitting him hard with cuts, representing an amped up hen. We were in a spot with pretty tight pines, visibility out to about 50 yards. He was just beyond this point. My eyes were strained for a good 30 minutes thinking I was gonna spot him. No dice. He was as hung up as an old gobbler could get, not budging from his post. Knowing this and that my chances were slim to none, I pressed on anyway, fueled by my burning desire to bag the Jedi. I moved from my original tree 20 yards to a prone position, during the transition, I left my phone at the first tree. I laid prone for over an hour, completely consumed by the hunt. After laying off the calls for ten minutes, I gave him another run with some yelps, clucks, and sharp cutting. Once' fired back with 11 gobbles in under 10 seconds…11!! I've never heard an Eastern, or any species of turkey, go on a gobbling rampage like he did that day in Akron at 10 in the morning. This moment was where Once' received his name, being the Spanish word for the number eleven. Losing track of time with my phone away from me and no watch, I failed to realize the deadline of 10 AM. We had to leave by then to get Sandy back to a class at Alabama. Well, this did not go over well with her, at all. She was several trees away from me at this point, but I saw in her eyes that I had done something very, very wrong. This hunt was over. As a general rule during turkey season, you always want to be in good graces with your significant other. Now that Once' had disrupted the home front, my feud with him was becoming more personal than ever. it was a quiet 45 minute ride home to Tuscaloosa. She was late to class, and missed an assignment. We gave the place a rest the next morning and tried an afternoon hunt. Steadman and I set up in a good looking spot on the creek bottom well before roosting time. It was breathtaking scenery but the turkeys roosted elsewhere. The next morning I took another hunting buddy, Spencer Pennington, for a FIFTH crack at him. I gave him a brief synopsis of what this old wily tom was about before we took off into the pine plantation. We decided to try a move thats worked in the past on a true wizard of the woods. This time I let Spencer do the calling in the second field, while I set up and stayed quiet in the pines 60 yards away to try to catch him in his circling act. Like usual, he gobbled constantly and we were stationed on his highway. But Once' passed through on the opposite side of Spencer from my position, in full strut again, just out of range. I remember meeting up with Spencer when we were heading out that day, he said, “you ain’t kidding, that bird’s not killable.” He had slipped through our fingers again, staying at that magical distance he liked to flaunt around at. It was like he had a constant radar locked onto us. Wherever we setup, it was off by just a tick, and committing to a decoy was just out of the question at this point. The ultimate tease, Once' lived to die another day. Time was working against me, big time. It was my last morning to hunt Once'. It was Saturday, April 5th, and I had to head to Houston the next day for mini camp. Anthony, Steadman, and I were gonna triple team him to make sure he didn't get away this time. One person in the middle calling with the other two on each side, covering as much ground as we could. Well Steadman pulled one on us, "slept through the alarm" or some nonsense. We were a man down, it was up to me and Anthony. It was another fine Alabama morning, 70 degrees with little to no wind. We trucked past the first field and down the road on the way to the second field. We waited there for Once' to give away his position. Locator calls weren't even necessary , Once' started gobbling on his own 10 minutes before daylight. He was roosted on the creek bottom to the left of the second field, around 200 yards away. I was thinking way outside the box, and set up to the right of that field, where the creek bottom made its circle around the pine plantation. I had seen him go from that side of the bottom to this side of the bottom, somehow evading us, more times than I could count. I couldn't even hear him gobbling from my position, this turkey really had me off the rocker, I was a good 500 yards away from him. Anthony was on the edge of the field, calling sporadically and keeping up with the Tom's location from Once's loud mouth. An hour after sun up, Once' was holding steady on the left side of the field in the same location he was roosted at. He didn't wanna venture up into the pines to play today. Feeling foolish, I traced back up to the road between the two fields. The creek bottom ran from the left of the first field up to the second field, in parallel fashion. I stood in the road until Anthony blew a crow call and got him to gobble. Once' seemed to be between the two fields, loafing in the bottom. I went back to the first field and dropped off the left edge into the woods. Moseying down the pines about a 100 yards, I reached the mouth of the creek. I sat here for about 20 minutes pondering my next move, the woods were silent. Looking straight down the lane of the creek, the woods made a type of U shape. A ridge on my left, flattening off into the creek bottom, and elevating back up to a ridge on my right. I see movement out in front of me, its a hen. She walked straight passed me, on the left side of the creek. She seemed to be a little ragged, like she had just gone through a traumatic experience… 5 minutes later, Once' let out his enormous gobble, I could recognize his distinctive voice from any other turkey on the planet. He was a decent ways from me, so i pushed up another 50 yards towards him. I was being very patient, he seemed to be content with the area he was in all morning, I knew he wasn't going to travel far. A few minutes later I let out a few soft clucks and purrs, he answered. Once' was 150 yards in front of me, on the left side of the creek. My heart was already skipping beats and I wasn't even close to him, but I knew I was where I wanted to be, in the bottom, with him. I called sparingly to him and it was evident he was happy with his position, he wasn't moving. By this point I was very cautious with every thought, step, and action I made. I surveyed the area for a few minutes, and thought using the creek was my best chance. The creek had relatively high walls, the lowest points being around three feet. I started my voyage down the creek. It had a soft sandy bottom that made it very quiet to walk in. Poised and collected, I slipped ever so slowly down the creek, measuring each step with precision. After crouching and crawling, doing everything I could to stay concealed from the bottom above me, I eventually made it to his lair. No question about it, I knew I was within 50 yards of Once', I could literally feel his presence. I took a knee in the creek to gather myself and decide on my next play. I really needed him to do what he did best, sound off one more time Once', do it son! Not wanting to give away my location, I blew a crow call and shocked the piss out of him, he roared! He was on the left side of the creek, very close. I slowly peeked an eye over the creek, scoping intently at every nook and cranny, he wasn't in sight. The bottom elevated quickly into a ridge that was 30 yards away, he had to be on top of it. After scanning the ridge for five minutes, I slipped out of the creek and immediately backed up to a tree. That moment was frightening, knowing he would see me somehow, but I was in the clear. I didn't move a muscle for 5 minutes, scanning the ridge and everywhere else, no movement anywhere. A yelping sequence came from the first field, Steadman had arrived from his slumber, and Once' answered excitedly. Just in the nick of time ole buddy, Stead had redeemed himself. No doubt, he was on top of the ridge directly in front of me, 30 yards away. I made a few soft clucks and pulled my gun up to the ready position, hoping he would peer over the ridge for his hen. Nothing doing. It was time. I stripped my vest off and starting crawling on all fours to make the ascent up the ridge. It was a sharp 45 degree climb up to the ridge, with it plateauing at the top. Moving slower than time itself, I made like a snake up the ridge. I could hear him drumming the entire way up, raising every hair I had on my body. Five yards from the top, Once' let out the last gobble he would ever make, and it shook my body from head to toe. I belly crawled two more yards up the last of the ridge and slowly raised up on both knees. Eye contact. All I could see was his bright white head. It was truly a magical moment. We peered into each others eyes 7 steps from one another, and he drummed three times in succession, acknowledging my unannounced presence. We both knew it was over. It was a moment in time I'll never forget, it seemed to last 5 minutes, rather than the actual few seconds. I made a fast dash up on to level ground with him, for a kodak moment of a strutting Once' at 7 steps, in all his beauty. He buzzed to the left in his strutting posture and I rolled him to the turf. I've been hunting for close to 20 years, and I've never had a moment like the one I had up on that ridge. I ran up to him and sprawled on the ground beside him when he breathed his last. Literally looking eye to eye with Once', we shared a moment, and paid our respects as he took his last gasp of air. It was a week long, remarkable journey coming to an end; bittersweet. If high def footage would've been on hand to see us on the ridge together, I'm certain it would have captured a few small tears streaming down the side of my face. I thanked God then and there for allowing me the opportunity to grow up in an hunting environment, being able to spend such quality time in the woods with friends and family, and giving me the chance to share the week in the woods with ole Once'. As for Once', heroes get remembered, but legends never die. Brad Smelley hails from Northport, Alabama and is currently a tight end for the St. Louis Rams. He’s been in the NFL for four years, with previous stints for the Cleveland Browns and Houston Texans. Brad played college football at the University of Alabama under coach Nick Saban, helping the Tide to National Championships in 2009 and 2011. He caught seven passes in the 2011 “Game of the Century,” to lead the Crimson Tide over LSU in the Sugar Bowl. 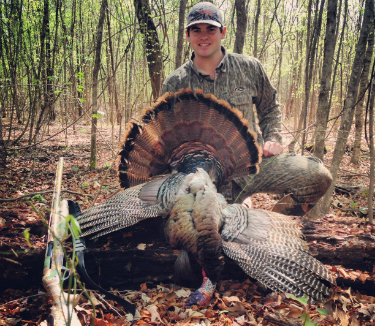 He’s had a love and passion for the outdoors from an early age, and has had the privilege to be able to hunt the great lands of West Central Alabama for most of his life. Brad loves all kinds of hunting and the camaraderie surrounding the sport, but specifically relishes the adventure and challenges of chasing wild turkeys each Spring. He can be reached via email at btsmelley17@gmail.com!